Ever the master of juxtaposing contrary lifestyles or ideologies and shaking them around until they either blend or, more often, explode, Stephen Frears reiterates much of the tone and style of the highly amusing, and smarter than it appeared to be, Tamara Drewe with Philomena, forcing together two people of different classes and educational backgrounds, playing off their disparate values. However, while Drewe played with the discrepancies between town and country life, suggesting something performative and unnatural about the urban dynamic, Philomena is more interested in interpreting superstition and the Church within the context of the modern age. The titular Philomena (Judi Dench) was impregnated in her early teens by a boy she met at the fair. Being raised in a strict religious household, she was sent to live with the nuns, where she would work for free and watch as her son was adopted by complete strangers. Fifty years later, she admits this secret to her daughter (Anna Maxwell Martin), who responds by approaching Martin Sixsmith (Steve Coogan), an out-of-work journalist she overhears talking about his craft at a cocktail function she's catering. That Martin is, in essence, degrading himself by tackling a human interest story — something for "weak-minded, ignorant people," as he puts it — raises his already prickly, albeit realist, disposition to a heightened sense of unpleasantness. Philomena (a devout woman who tells every kind person she meets that they're "one in a million" and seems excited by the proposition of watching Big Momma's House in a hotel room) is decidedly less surly and cynical, anxiously speculating about the possible life her missing son might have led. Though the film is presented respectably and, quite often, hilariously, with two very different people talking about worldviews and social issues from completely opposite ends of the spectrum, it is, at its core, filled with an ambivalent rage towards the Catholic Church. 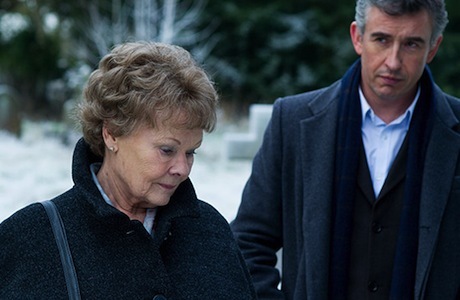 Philomena's quest to find her son starts with disappointment when she learns that the records of his adoption were mysteriously burnt in a fire some decades prior. The nuns she deals with, though technically polite, tend towards dismissiveness, outright ignoring and responding with uppity hostility towards Martin, while merely patronizing the older woman they kept doing slave labour as a teen. Frears, building up a position that vilifies the greedy, capitalist angle of the Church, is careful to insert images of their lobby concession stands and focus on the random photos of Hollywood celebrities on their wall. That Philomena's missing son turns out to be a homosexual is similarly not just a coincidence. How the Church tackles sexuality and condemns those that indulge in an act built into their biological make-up is discussed at pivotal moments, suggesting an inherent, flawed logic and hypocrisy in the treatment of "God's children." Because everything is so polite and accessible though, having the pleasant ease of something a mixed seniors group could watch on a Sunday afternoon, the nasty bite of it all is deceptively pain-free. Frears may be presenting an agnostic journalist character content to yell and swear at a 90-year-old nun, but he's also conscious to appreciate Philomena's inner-struggle to determine what faith means to her, in a world where her life was treated with such cavalier indifference by those that shared her core beliefs. As usual, the caustic British auteur isn't keen to specifically answer the questions raised or glibly provide some sort of convenient solution, rather he wants to expose the situation for what it is and let people come to their own conclusions. That this journey begins as a human interest story for "weak-minded, ignorant people" and turns into something far more substantive adds another interesting topic for discussion, suggesting that, on occasion, the truth of a situation and our collective experience may be far more complex than old-fashioned, hard-nosed journalism might imagine.